If I were making a movie with two women playing mother and daughter, Oscar nominated Saoirse Ronan of Atonement, and Brooklyn, and Emmy and Tony Award winner Laurie Metcalf of Toy Story, Roseanne, the Steppenwolf Theater and at least 14 Broadway and off-Broadway plays, would be on my dream list. Apparently Greta Gerwig agrees. Before the beloved Indie actress, writer and now first time director Gerwig called her new movie Lady Bird, she dubbed it Mothers and Daughters. That was back when her first draft was over 300 pages long. The finished screenplay is blessedly shorter, and both it and the film as a whole is an unqualified delight. Christine, (Ronan) is a 17 year old girl, going through her last year of high school, who calls herself Lady Bird. She is straining against the confines of her middle class life going to Catholic school. She believes anything is better than Sacramento, especially the East Coast. She relates that to her mother repeatedly, along with all the other complaints about her life. Her mom Marion McPherson (Metcalf) only wants the best for her daughter, for whom both she and her husband have worked overtime to allow for her expensive Catholic education. Christine spends her time with her best friend Julie (the awesome and luminous Beanie Feldstein) and the both of them are at best on the outskirts of popularity. Christine tries in a variety of ways to break in to the popular cliques, first by dating buddy Danny in her drama group (Lucas Hedges) and then by dating mysterious musician Kyle (Timothy Chalamet). Things work, or don’t work, exactly as you’d expect for a girl trying too hard to fit in. It is often as awkward as real life. Lady Bird, as it happens, is funnier, and the frequent interactions with her mom, for better or worse, allow for a familial authenticity many will recognize from their own lives. The name harkens back to the nursery rhyme, “Lady bird, Lady bird, fly away home”. Audiences will be called to consider what home means for young people considering the bigger world and their place in it. For her own part, Gerwig says she didn’t realize she was pulling words from a popular children’s rhyme when she named the movie. 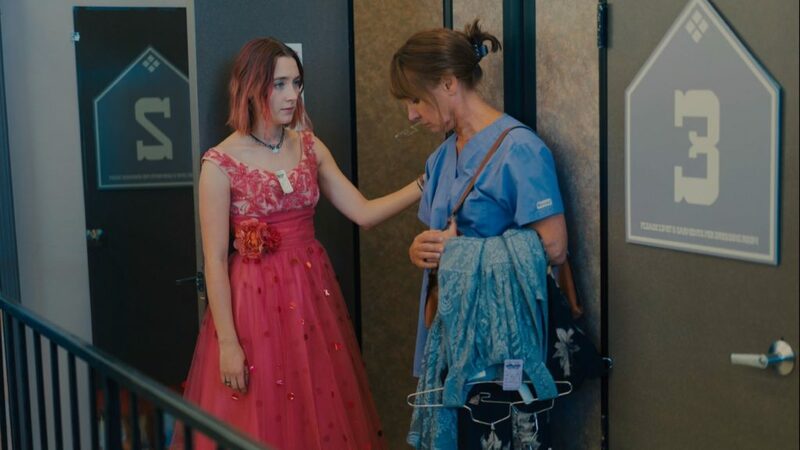 Still, the character of Lady Bird feels shame around her own class, as her family is struggling financially. She believes inhabiting a new name and going to a new place will fulfill her, or change her into who she wants to be. This film, and Christine “Lady Bird” McPherson’s progression, is about finding her way back to who she is, and where she comes from, including the shifting position she holds in her family. Taking the trip with her is a joy, and the cast and filmmaker taking us there create a singular, authentic experience that will place Lady Bird on the list of most memorable, enjoyable coming of age films. I asked Gerwig a few questions when she came to the Middleburg Film Festival, and before LADY BIRD became one of the top rated films on Rotten Tomatoes, hopefully placing her as a frontrunner for a Best Director Oscar nomination. Cinema Siren: When I think of Lady Bird, I think of the nursery rhyme. “Lady bird, lady bird, fly away home. Your house is on fire and your children are gone”..I’m interested in the idea of home and what it means to identity and how it plays into the film. 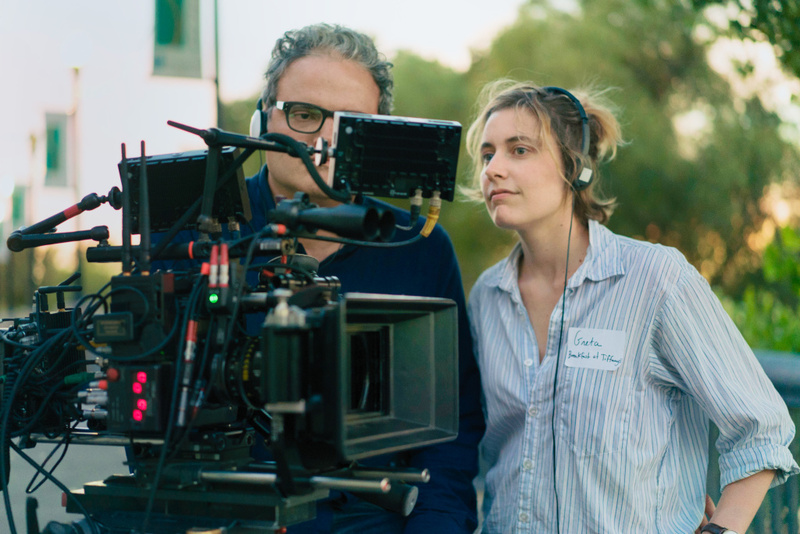 Greta Gerwig: It’s funny, I didn’t consciously understand why I chose the name Lady Bird, I just was working on the script and writing different scenes and I felt like I kept hitting some sort of block around it. I put everything aside and wrote on the top of the page, “why won’t you call me Lady Bird? you promised that you would.” and I thought, “Who is this person? Who is this person who makes people call her by this name?” and in retrospect I also remembered that rhyme, and I also thought about the act of re-naming, and what that means and how it can be both a religious act and a secular act. At confirmation, you choose your saint name. You choose the thing that you’re trying to emulate and the space that you’re trying to occupy. Or if you want to become a rock star or movie star and you choose a name, Marilyn Monroe or David Bowie, those aren’t their names, they chose bigger things than themselves before they were able to step into it. What’s interesting to me is that it has a double meaning which is that you sort of have this supreme confidence in yourself that you can be bigger than you are, and it also has a deep insecurity imbedded in it, which is that you are not enough. I think for me being able to grapple with home, and what home means, and it only being able to make sense as it retreats from you, or you leave it, is so much a part of that because i think accepting where you are from and incorporating that into who you become is complicated, especially for teenagers. I don’t know very many teenagers that think, “I’m great just as I am, and where i’m from is awesome”. There’s all this stuff built into you at that age where you think that you’re wrong, the place is wrong, the certainty that life is happening somewhere else, and you just have to get to the life that actually happening in another place, and then once you get there, you realize life is going on all the time. So that’s not exactly an answer but it’s a collection of thoughts around what that means. CS: My experience with talking to female filmmakers is they are very centered in collaboration, although you’re in charge of bringing it all together. Can you talk about your perspective on collaboration as a woman in film and how it influenced your first experience directing? GG: I think film is one of most deeply collaborative arts, whether you’re a man or a woman, it just is, like the theater, where everyone comes together. If what you want is total artistic control, you should be a novelist. That’s what you should do, because you can control it from beginning to end and it’s all yours. Film even people who seem to be ruling over things with what seems like an iron fist, there’s just no way you can, and I don’t think there’s a reason you’d want to. For me, I always had a very clear idea of how it looked and sounded and would be put together, and I think most films you have to know your true north, and your own compass, because really everyone can only bring their collaborative efforts to you if you know what you’re going for. Ultimately what you do is you kind of get everyone to dream the same dream you’re dreaming. So you collaborate to hypnotize everyone to the same place so that we’re all making the same film. It’s this combination which is a paradox, because that certainty that gut feeling and that true north comes from you, and that is what makes it collaborative. So it’s both and, it’s not either or. I love people bringing their whole selves to it. For example, with the actors, I’m a very involved director, and in terms of the script, we don’t change any of the lines, and I do a lot of takes and give a lot of feedback, but also I feel like there’s this very important moment early in the rehearsal process where I give the flame of the character to them, and it’s theirs. It’s their job to take care of it, and at that point, I don’t know more about that character than they know. You have to give your actors that trust, otherwise they’ll never be able to fully inhabit it, if you keep it too close to yourself. It’s this thing of giving it away and trusting that it’ll come back. CS: It is about trust. GG: Oh yes, hugely. That’s why I take a long time building my creative team, because these are the people you’ll be making the movie with and the actors of the ones everyone sees onscreen but every single person involved in the production, down to the P.A.s are the people who contribute to what that movie is and how it feels and every single person has to be a storyteller. Even the people in accounting, even the people making the schedules every day, everyone has to be a storyteller. Otherwise you could do that in any other kind of job. It’s about this kind of storytelling. This is a small example, but the first assistant director is responsible for how each day goes. what scene we start off with and where we go before lunch and after lunch, and they do it for the entire schedule. My first A.D. was so sensitive to what the story was and where the actors would be and what the experience of making it is, because that’s the way he is and that’s his way of storytelling. It’s essential to have a team of storytellers that choose together to tell this particular story. Lady Bird, after breaking records for the highest gross in limited specialty release, is opening wide across the country.